Amongst the 638 names of Victoria College's (Jersey) masters and former pupils who died or served during the Great War that are listed in the College's Book of Remembrance is that of Henry Charles Biard. Old Victorian (OV) Henry Charles Amedie de la Faye Biard was born on 1st January, 1892 in Godalming, Surrey, where his French father, Raymond was an Assistant French Schoolmaster at nearby Charterhouse. His brother, Walter Lucien, was a year younger and it was during 1906 and 1907, that while the family were living in 2 Claremont Terrace, in St Helier, that both boys attended the College. Today, it is not clear why the family came to live in Jersey, or indeed did not stay longer, although his maternal grandfather had lived in Jersey during the 1860s. However, by 1909 it seems apparent from Henry's autobiography "Wings", written in 1934, that they were back in England. For, it was at the beginning of that year that the 17 year old Henry was bitten by the urge to fly, having watched aircraft going through their paces at Brooklands. At various times Biard is recorded as being called Henry or Henri. Henry is used throughout this article for consistency. In due course, Henry was appointed as a Flying Instructor by Graham-White and on 4th June, 1912 was awarded the Royal Aero Club's Aviator's Certificate No. 218. Pilot training was rudimentary, and with aircraft just capable of a maximum speed of 40 mph, and a stalling speed of 38 mph, somewhat risky in terms of life and limb. There were no dual controls whereby an instructor could take over command of the aircraft from an erring student, and the instructor was to be found unable to intervene physically as he was sat on the fuel tank! 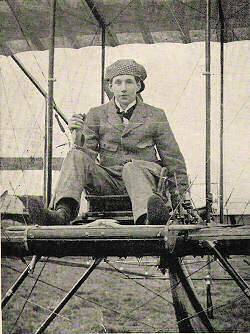 Henry might rightly be regarded as an aviation pioneer along with the more recognised names such as Sopwith or the Roe brothers. It was at about this time that the services established a Central Flying School (CFS) at Upavon airfield in the middle of Wiltshire's Salisbury Plain, with its first Commanding Officer being Captain Godfrey M Paine RN and the Senior Staff Officer a Major Hugh Trenchard. It was on 16th April 1913, after gaining his Aviator's Certificate, that Henry was awarded a probationary commission as a Second Lieutenant in the Royal Flying Corps (RFC). During the period at Upavon, Henry witnessed the aftermath of the crashes that killed Majors Alexander Hewetson and George Merrick, the latter whose funeral he attended having borrowed the deceased's Sam Browne belt, and whom he would later liken to Osborne, the "Uncle" character in RC Sheriff's "Journey's End". While at the CFS, he himself was involved in a crash as a passenger, the pilot being none other than Trenchard! However, Henry's service with the RFC ended, according to the London Gazette No. 28836, on 3rd June, 1914, for it was announced that he had resigned his commission, although the reason for this is not evident today, nor was this occurrence mentioned in "Wings". (Coincidentally, on the same page of that Gazette was the announcement of the promotion on 15th May, 1914 of fellow OV Stuart Le Geyt Cutler, to Lieutenant with the 3rd (South) Battalion, RMIJ. Stuart Cutler would later die while serving with the RFC over the Ypres Salient). At the time of resignation, it could not have been envisaged that war would break out across Europe barely two months later. When it did, by chance, Henry was staying at his paternal grand-father's farm in northern France. There he witnessed the continual flow of French refugees struggling westwards with many of their possessions on carts, along with German cavalry passing through a nearby village and a few days later, further cavalry setting alight to numerous properties, including his grand-father's farm, as wanton acts of reprisal. Henry managed to return to England and thereupon to Graham-White's Flying School at Hendon, and where it appears that he remained for the next two or more years, where his Flying Instructor skills were in demand to address the required increase in the numbers of students who would soon find themselves over the front lines of France and Flanders. During this period many new skills had to be learnt, so that pilots could better survive the rigours of aerial combat. Aircraft manoeuvres such as rolls or getting into and out of spins were now taught, a testimony to the improvement in aircraft capability in the five or so years since Henry first flew, when such activities would have proved fatal.